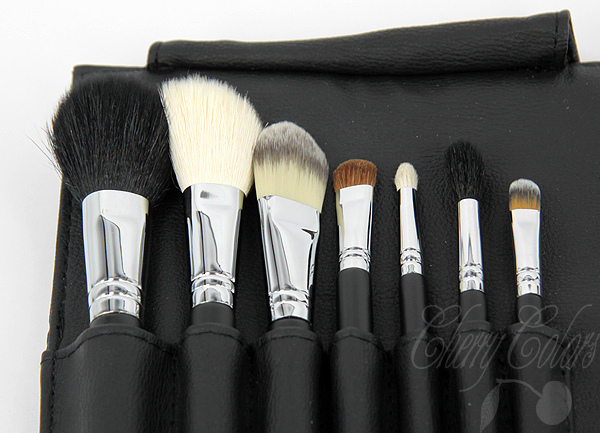 Review: Sigma 7 Pieces Travel kit in Naughty in Black +F50 - Cherry Colors - Cosmetics Heaven! It's been a while since I promised you this review. But now I've finally tested the brushes to the max and I can share my opinion. So here it is - Sigma 7 pieces travel kit in Naughty in Black! This is how everything was packaged - lovely! Inside there was a brochure explaining what each brush is used for even the freebie (E50- stippling brush) is mentioned but not the foundation brush. But still pretty useful. 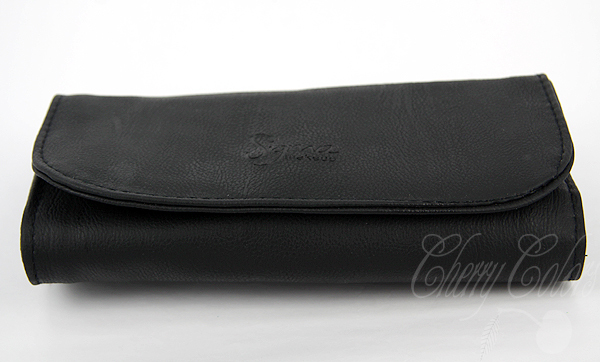 The brushes come packaged in a lovely leather (very soft) pouch. It is big enough to take it in your purse, well if you have a big purse. Mine isn't so I keep them at home. The brushes you get :)! Now I'll write a little bit about each of the brushes I got. I love this brush! It's very dense and luckily it doesn't shred a lot. In the months I had it maybe lost 1-2 hairs. It makes eye shadow application quick and easy. I would buy it! Precise application of color on the crease, outer corner, and upper and lower lash line. Also ideal for smudging out pencil liner. Natural bristles. This the second most used brush from this set. First is E55. I use it to apply shadow on the crease and sometimes to blend it out a tiny bit. It does shred a bit. I'd buy it! The rounded, tapered, flat shape makes this brush ideal for concealing the under eye area. It is also recommended for a precise application in small areas. Synthetic bristles. Well, I don't use this brush much. I prefer applying concealer with my fingers on myself. But luckily this brush doesn't shed! So if I were looking for a concealer brush - this would do the trick! Rounded and tapered top. Specially designed to apply and blend color into the crease. Natural bristles. I'm not a huge fan of this one. It's way too soft and it isn't dense enough for better blending. It does its job, that's correct but if I were buying a blending brush I'd skip this one. 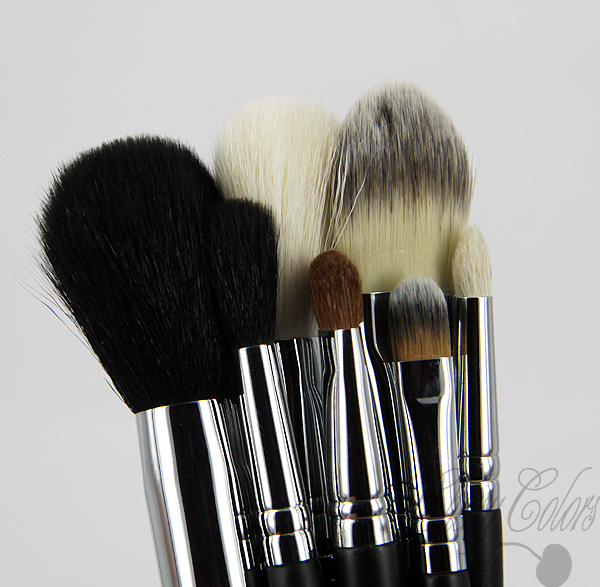 The angled shape makes this brush ideal for applying blush or contour shades. Natural bristles. I like this brush because it does its job well. I wish the bristles were firmer and maybe a tad harder (?) because I mostly use it for contouring. It does also shared quite a bit which is annoying. I don't think I'd purchase it separately. I am not a big fan of foundation brushes. I do prefer stippling brushes because they give a more natural finish. And usually foundation brushes are harder to clean (I have one from Isadora). I don't like it. Specially designed to generate an airbrushed finish when used to apply liquid foundation. It can also be used to apply blush, highlight shades, and loose pigments. A blend of synthetic and natural bristles. I had the highest hopes for this brush. I have another stippling brush (by Sephora) and it shreds like crazy. I hoped this one doesn't. But sadly it does. Not as much as my old one, but it still does. Which is quite a lot! It is still a great stippling brush but I hate all that hair that gets stuck on my face while I apply foundation! Skip! So out of 8 brushes I love 3 brushes and like 2 more and 3 of them I'd just skip. I really like the length of the handles because they're not too long or too short. They're perfect! After all this set isn't that bad and because of the variety you get in the kit, I'd probably buy it. I don't buy expensive brushes because I think you can get great brushes for a fraction of a price, but with Sigma I'd make an exception. I especially like their colored brushes and so far my brushes from the kit look as good as new! Well, I was expecting a little bit more from the brushes, but overall I'm happy with what I got. It would be perfect if the brushes wouldn't shred at all (especially the powder and stippling one), but maybe they will improve that in the future. This product was sent to me by the company itself or its PR. For more information please do read my Disclosure Policy. I am also affiliated with this company and I get a small amount from your purchases if you use my links. My reviews are ALWAYS honest.